Illustrations by Angela Barrett from a retelling of the story of Joan of Arc (text by Josephine Poole). Cover illustration by Terence Greer. Suffice to say Before the Dawn on record does not disappointment: it’s a rare moment of life affirmation on many levels. For the record, it’s as visceral and beautiful as the live event, and proves that the theatre dressing was just that: the music was all. That’s especially the case with the Sky of Honey suite from Aerial, which has such fire here that it edges The Ninth Wave from pole position. The original elements of birdsong, sun and moon that cradle the concept are amplified, embellishing Molly Bloom’s sensual world, building to conclusion with the warrior-like energy of a Saint Joan from the opening set. In the midst, the song given to Kate’s son, ‘Tawny Moon’, might seem a flashback to her teenage self. There are hints there in the vocal, beneath the assured delivery that owes more to musical theatre, of a legacy in the intonation. And there’s something poignant in the lustful bravado of the song’s character, wooing the lunar goddess, the muse, as if she’s some shy young actress on an Edwardian stage (a scenario that sounds sent ghost-like from Cathy’s Lionheart years) in the hands of someone so young, with the great weight of his own creativity to shape and form in the shadow of a similar titan. Despite the desire for lost domains, to live or relive on film, the recording is more valuable: it’s a portal to our own sense memory. The Ninth Wave might have benefited from visuals: the written dialogue, both sketch and pilot, are lame or awkward, and yet, when Kate makes exceptions like this they only prove the rule, like letting Elton John batter the subtlety out of ‘Snowed in at Wheeler Street’ on 50 Words. It’s humanity. Flowers on both sides, each side has weeds and gladness and sadness. Walk on the rainbow flooded by both side’s truths and opinions. Wish that I were corny. Something beautifully, achingly melancholic for anyone feeling not particularly attractively melancholic in these times. Trite play with song titles obviously completely crap, but that’s not the reason. It’s just a lovely, lovely song from The Dreaming Spires, whose brothers Robin and Joe Bennett also play live with Saint Etienne and Sarah Cracknell from time to time, and who Andrew Marr put on his show last year when they released Searching for the Supertruth (which features the splendid Dusty in Memphis among others). Where will all the antlers go? There’s a strange moment of stasis around the middle of a decade. What once gave it new character is part of the furniture. What will endure, what will die the death of disco? Take, for example, utility styling, the wilderness motif, crafted things, Eric’s Gill Sans font, brogues and bearded youth, the faded hues of Instagram. While detractors might call it a warm womb of heritage nostalgia, there’s been more at work here. Life via screens grew to an ever brighter, whiter noise of option and opinion, and perhaps more than anything we needed an antidote, a compass that leads us back to the essentials of existence. There’s been a quiet affirmation of the offline world, where time and application breeds skill, imagination and creativity, and technology is still our servant. In the next few years the digital world will be pushed into every inch of our lives, from the surface of our clothes to the pores of our skin, our souls second-guessed from online data and assigned a banal pigeonhole. We won’t walk down the street without the demand to interact with some digital street art or a shop display. Yet in ten years’ time we might laugh at the accepted wisdom which told us our mundane day-to-day activities would be managed by a glorified teasmade, probably operated by Google or Amazon. Unless we’ve already been cloned in the style of Charlie Brooker’s Black Mirror: White Christmas, where our consciousness is downloaded and trapped in an egg-shaped device to programme our day. What defines a decade? Aesthetic values can only become tired and clichéd, to lie fallow until another generation sees them shorn of association, timeless in appeal. But what of deeper values, the stuff of life – are these also subject to fashion? Social media has fostered community action; more voices value our ‘ordinary’ built and landscape heritage; the provenance of food and drink matters and the ethics of consumer choices are in the mainstream if not expansive. Is it also safe to say it’s the decade in which we affirmed our relation to the landscape and place as part of the natural world, rather than some irrational disease afflicting it? All these things coincided with the rise of the hipster, a profile which became the tabloid-lazy term of choice for anything counter-cultural, rather than a byword for superficial styling. Yet there are values within it, shared by many. The hipster in the 2020s will have the cultural currency of the hippy in the 1980s. Will the antlers on the head fall away like the flowers in the hair? Without the urge to profile and define, which can belittle and destroy, we might take the substance with us and let the styling run its course. Not so long ago critics would dismiss the film as swinging-sixties style tacked onto Hardy’s Wessex – to the casual observer, perhaps not unfairly. 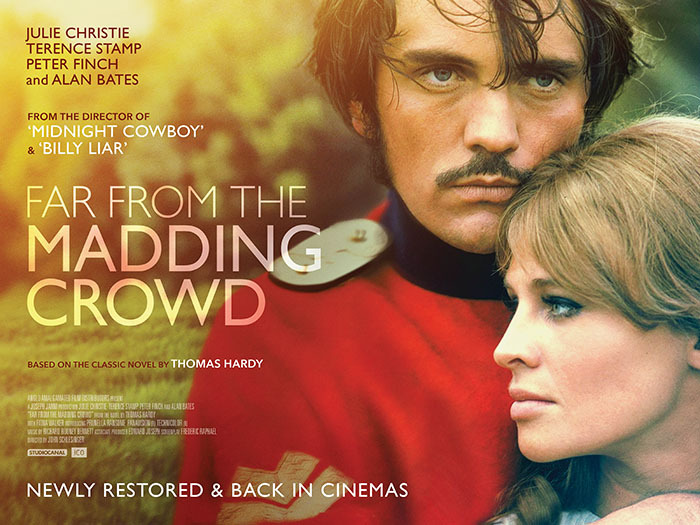 The popular notion was that The Kinks had name-checked Terence Stamp and Julie Christie in ‘Waterloo Sunset’ in the year of release (something Ray Davies denied: “It was a fantasy about my sister going off with her boyfriend to a new world”). Filmed in Dorset in the autumn and winter of 1966-1967, it’s not surprising Schlesinger’s film didn’t translate well to a Hollywood expecting a Dr Zhivago epic. After all, Schlesinger wanted to “dig out the dark spiritual side of Hardy… with verisimilitude”. As any Hardy aficionado will appreciate, this could be tantamount to setting your picnic in a crypt. The restoration has been supervised by its cinematographer Nicholas Roeg (who in 1967 was yet to be the lauded director). 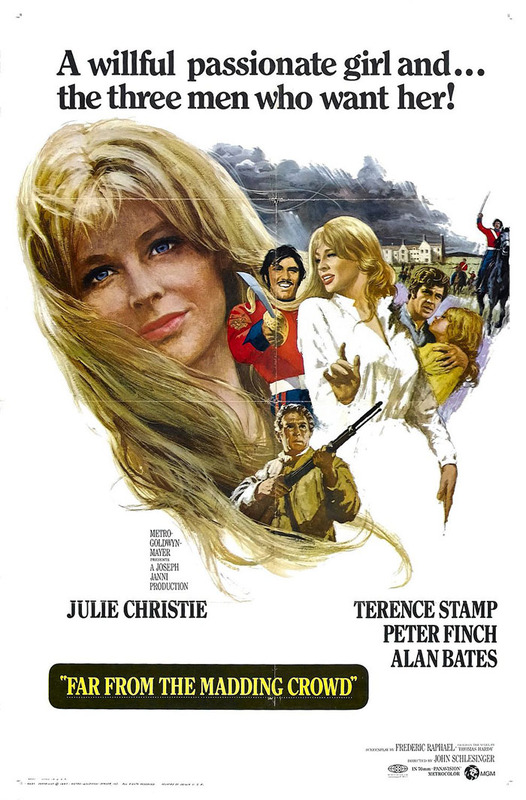 At nearly three hours, it does demand a little of the viewer, but it’s a truly beautiful film, with a lush Oscar-nominated score from Richard Rodney Bennett, and the superlative casting of Alan Bates, Peter Finch, Julie Christie and Terence Stamp. Perhaps its renewed appeal owes something to Schlesinger unearthing the landscape of a Victorian past in 1967, to clash with the hipster faces of Britain’s gentle, modish revolution. You could say Schlesinger’s film is now an uncontrived landmark, part of a timeline that tracks how we’ve looked to the landscape for authenticity: whether then, in the face of a ubiquitous ‘sixties scene’, or now, in the face of rampant capitalism. And contradictions of style and substance – are they not the very heart of Bathsheba’s dilemma? Released throughout the UK – see here for screenings.